This issue features three stories and ten pin-ups. 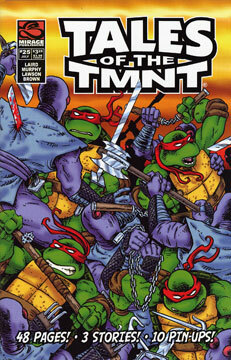 “Kung-Fu Theatre” – 20 page story by Laird, Murphy, Lawson and Brown (reuniting Lawson and Brown, the original art team on “Tales of the TMNT” volume one). Pin-Up gallery featuring Dario Brizuela, Eric Talbot, Stan Sakai, Michael Dooney, Sean Wang, Dan Berger, Dave White, Jim Lawson, Don Perlin and Diego Jourdan. “My Hero!” 5 page story by Jourdan, Laird and Murphy. “The Doors of Deception” – 6 page Professor Obligado story by Murphy, Lawson and White.